Earlier this week Hubby dropped me off at my favorite quilt shop to drool a little while he did some other shopping. I ran into one of the ladies from the sewing circle, and she helped me pick out a pattern for my first quilting experiment experience. I had originally wanted to try a mini runner because I really like the pattern. But after looking at it again and thinking about how difficult it would be to deal with 1/2" to 1" strips and squares and triangles, I decided to pick something different. My new friend Vi insisted that I could still do that same pattern, but double or quadruple the measurements to make a normal-sized runner. I was shocked...this is my first project and you want me to...(gulp)...adjust? No way! 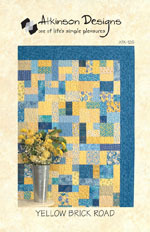 So I picked out this pattern instead, Yellow Brick Road by Atkinson Designs. It's nothing fancy, designed for a beginner, and should be a good one for me to cut my teeth on. I'm going to do the lap size in hopes that it could actually be something usable for me rather than a crib-size that I'd only use as a wall hanging. I really like the blue and yellow color scheme on the package but I'd already been picking up fat quarters for whatever my first project turned out to be, and they aren't blue. In fact, they are cinnamon and black and cream. Nice prim colors. I have nine or ten fat quarters and need a total of 12 for the project; I bought a yard of fabric that coordinates with the fat quarters a week ago because it was on sale; I'll need twice that for the border and binding. And I found some black fleece for the backing on sale (score!). My sewing machine is on its way; I decided to go with the Brother SE-400. So is the AccuQuilt GO! that I ordered since I knew I'd never have the patience (or grip strength) to cut out hundreds of squares or triangles or hexagons for a single project. I went ahead and ordered some extra dies that I knew I'd want (circles and stars and 2" squares) since they were also on sale. After going through a gajillion fabric and hobby stores this week, I think I now have the bare basics to get started: self-healing rotary cutting mats (one large and one small) and a rotary cutter (for the shapes and sizes my AccuQuilt GO! won't do), a quilting foot for my sewing machine, extra bobbins, plastic boxes to hold my bobbins and thread, quilting pins, and several OmniGrip rulers. Then I spent way too much time online and ordered some beautiful cotton quilting thread from Connecting Threads, plus two quilt kits that were on sale and the fabric needed for the backing. Also on order is a book that was recommended to me for beginning quilters, plus another book on doing your own machine quilting. I hope the books arrive before my machine gets here! I'm really excited about getting started and hope that everything works the way it should and that I don't get frustrated. If I do, you guys need to remind me how much I wanted to try this, okay? I know when I actually sit down and start to cut my first fabric, I'm going to really be stressing out, worried that I'm going to mess something up. So, here's a question for you quilters (and other crafty folks): Do you have any advice for a beginning quilter? Something you know now and wish you'd known when you got started? Or is there a tool that you just can't live without that you think every quilter should have? Do tell! You are freaking me out... I looked at the Brother machine too! I'm so excited you are taking the first step in this quilting deal... Hopefully I won't be far behind! Okay, this is just like me, when I decide that I want to do a particular hobby, I buy enough supplies to open a small store. Good luck and remember when you are stressing over the fabric, "it is just that, only fabric" Try cutting some experiment pieces with muslin first! I bet your quilt will be beautiful. It's kind of funny...I worked in a quilt shop and I've never made a quilt, so I can't give you any advice. I was the one that did all the crafty classes. You have made some wonderful choices to start quilting. I just bought the Accuquilt Go and I love it. My advice would be to make sure your seams are all consistent. You can do this by using a 1/4 inch wide quilting foot.Check each block and measure as you go to make sure they are all uniform. I made the mistake of not working on a quilt for about a year. When I started working on it again, I must have used a different foot and all the blocks were smaller than the first ones I did! Had to rip them all apart and start over!Good luck, I'm sure you will do a fine job! Oh gosh...there are so many things that are important to know. 1. Stick to one brand of ruler. Different brands have different lines that can result is different cuts. 2. Always start and end with the same sewing machine on a project. Different machines sew differently...aka not all 1/4"s are alike. 3. Learn to use a scant quarter inch. The easiest way to test your seam allowance is to sew two 2" squares together, press and then sew a 2" x 3 1/2" rectangle to the side of the sewn squares. If your rectangle goes past your squares, your seam allowance is too big. And if your rectangle doesn't go to the end of your squares then your seam allowance is too small. Using this technique will help you find the perfect seam allowance. Good luck with your first quilt! I can't live without my lipped cutting ruler. measure twice (or 3 times and cut once)...just like woodworking! hehe. Best of luck.